The Cleveland Indians visit Fenway Park on Wednesday, August 2, 2017 to play the Boston Red Sox. The probable starters are Trevor Bauer for the Indians and Rick Porcello for the Red Sox. The opening line for this matchup has Cleveland at +114 and Boston at -124. The Indians have a 40-57-7 over/under record and a 45-59-0 run line mark. The Red Sox are 53-54-0 against the run line and have a 47-56-4 over/under record. The Indians have a 57-47 overall record this season. Starting pitcher Trevor Bauer has a 9-8 record with an earned run average of 5.25 and a WHIP of 1.46. He has 117 strikeouts over his 106.1 innings pitched and he's given up 113 hits. He allows 9.6 hits per 9 innings and he has a FIP of 3.9. The bullpen has an earned run average of 2.77 and they have given up 267 base hits on the year. Teams are hitting .222 against the bullpen and they've struck out 353 hitters and walked 107 batters. As a team, Cleveland allows 8.1 hits per nine innings while striking out 10 batters per nine innings. They are 4th in the league in team earned run average at 3.71. The Indians pitchers collectively have given up 825 base hits and 379 earned runs. They have allowed 114 home runs this season, ranking them 26th in the league. Cleveland as a pitching staff has walked 288 batters and struck out 1022. They have walked 2.8 men per 9 innings while striking out 10 per 9. They have a team WHIP of 1.21 and their FIP as a unit is 3.59. As a team Cleveland is hitting .264, good for 5th in the league. The Indians hold a .439 team slugging percentage and an on-base percentage of .340, which is good for 3rd in baseball. They rank 8th in MLB with 9.0 hits per game. Edwin Encarnacion is hitting .253 with an on-base percentage of .373. He has 92 hits this season in 364 at bats with 60 runs batted in. He has a slugging percentage of .470 and an OPS+ of 117. 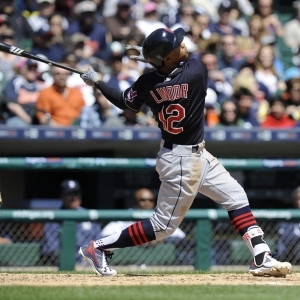 Francisco Lindor is hitting .270 this year and he has an on-base percentage of .330. He has totaled 113 hits and he has driven in 49 men in 418 at bats. His OPS+ is 103 while his slugging percentage is at .464. The Indians have 931 hits, including 219 doubles and 122 home runs. Cleveland has walked 393 times so far this season and they have struck out 732 times as a unit. They have left 753 men on base and have a team OPS of .779. They score 4.87 runs per contest and have scored a total of 506 runs this year. Boston has a 58-49 overall mark this year. With an earned run average of 4.55, Rick Porcello has a 4-14 record and a 1.38 WHIP. He has 126 strikeouts over the 140.1 innings he's pitched. He's also given up 167 hits. He allows 10.7 hits per nine innings and his FIP stands at 4.33. The bullpen has an earned run average of 3.02 and they have given up 279 base hits on the year. Teams are hitting .226 against the Red Sox bullpen. Their relievers have struck out 340 batters and walked 111 opposing hitters. As a team, Boston allows 8.5 hits per nine innings while striking out 9.3 batters per nine innings. They are 3rd in the league in team earned run average at 3.7. The Red Sox pitchers as a team have surrendered 921 base knocks and 399 earned runs this season. They have given up 125 home runs this year, which ranks 20th in Major League Baseball. Boston as a staff has walked 293 hitters and struck out 1007 batters. They give up a walk 2.7 times per 9 innings while they strike out 9.3 per 9. Their team WHIP is 1.25 while their FIP as a staff is 3.76. As a team, they are batting .261, good for 7th in the league. The Red Sox hold a .404 team slugging percentage and an on-base percentage of .333, which is good for 7th in baseball. They rank 7th in MLB with 9.1 hits per contest. Xander Bogaerts comes into this matchup batting .282 with an OBP of .338. He has 107 hits this year along with 43 RBI in 379 AB's. He maintains a slugging percentage of .409 with an OPS+ of 96. Mookie Betts is hitting .270 this season and he has an OBP of .344. He has collected 116 hits in 429 at bats while driving in 66 runs. He has an OPS+ of 110 and a slugging percentage of .462. The Red Sox as a unit have 971 base hits, including 189 doubles and 105 homers. Boston has walked 378 times this year and they have struck out on 776 occasions. They have had 755 men left on base and have an OPS of .737. They have scored 4.66 runs per game and totaled 499 runs this season. Who will win tonight's Indians/Red Sox MLB game against the spread?